In the 1970s Rolex furnished some of their Day-Date watches with colorful lacquered dials, which later became known as Stella dials. These particular vintage Rolex watch collections are rising in popularity and the pop of color look fantastic — whether worn by men or women. Here are 12 awesome Instagram photos that celebrate these rare vintage Rolex pieces of #wristcandy. Take my breath away ? #originaleverything #nofilterneeded #beauty #rolex Good morning from me ?? Will there be a pot of ? at the end of the rainbow? P.S NO CYCLOPE!! 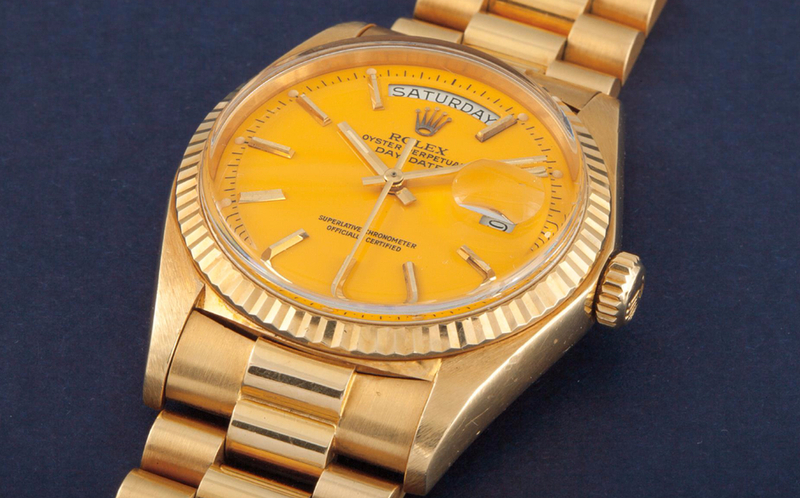 We’ve just updated phillipswatches.com with new content, including this exceptionally rare watch from our 9 May #GlamorousDayDate sale – the “Coral Bay” Rolex ref. 18038. Also known as the “Gulda” – named after the Austrian pianist – and made in 1988, this is the only Day-Date known with a soft, ‘angel skin’-colored coral dial. Playing around with straps on my vintage Stellas. Can you guess which is the hardest to find? ? ?